Inspired by the vibrancy and rich flavours of Middle Eastern cuisine, this real crowd pleaser of a mid-week meal is quick, healthy and super-tasty. What more could you want? 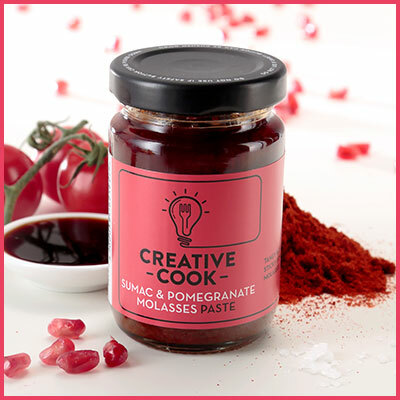 To Garnish – 125ml natural yogurt mixed with 2 tsp of Sumac Paste. First off pre-heat the oven to 180°C/Fan 160°C/Gas Mark 4. Place salmon, skin side down, onto baking paper on a tray, cover each fillet with ½ tsp of Sumac Paste and then bake for 15 minutes until salmon is piping hot. While the salmon is cooking, place the cherry tomatoes on a separate baking tray and cook in oven for 10 minutes. Next up pour the boiling water or stock over the couscous In a bowl, cover with cling film and stand for 5 minutes. Add the finely chopped mint & parsley, ½ jar of the Sumac Paste and the olive oil to the couscous and mix thoroughly before gently adding the cherry tomatoes. Finally place the salmon on top of the couscous, serve with a generous dollop of Sumac yogurt and wait for the smiles.